Scholarships & Awards | MBLN - Massachusetts Black Librarians Network, Inc. 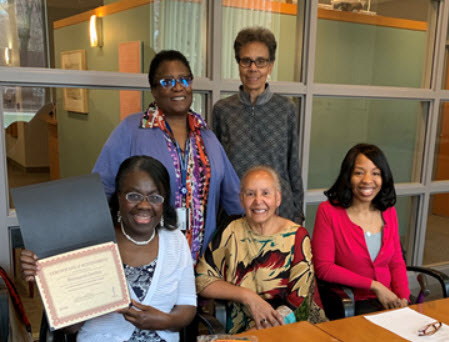 The Massachusetts Black Librarians Network Scholarship fund has been established to provide financial assistance to students entering a Master’s program in Library and Information Science accredited by the American Library Association (ALA). The Network awarded its first scholarship in 1985. In 1995, the scholarship was renamed after June Mullins (1929-1994), a long time activist and a Network member. June was born in New York City and spent her early childhood in Cambridge, Massachusetts. After a brief career in the U.S. Navy, she attended Howard University’s School Dental Hygiene from 1953-1954, followed by Virginia State College from 1956-7. June received a Bachelor of Arts from Northeastern University in 1980 and a Master of Science in Library and Information Science from Simmons College in 1985. June’s professional career as a librarian included positions at Lassell Junior College, Massachusetts College of Pharmacy, and the MIT Laboratory for Computer Science, before going to Tufts University. June retired from Tufts University in 1994, where she had served as Assistant Reference Librarian at the Wessell Library. Congratulations to Hermayne Gordon, the 2019 MBLN Book Award Winner. Hermayne is a part-time student in the LIS program at Simmons School of Library and Information Science.